Searching for a local auto repair shop in West Covina? You’ve found the best auto repair shop! Don’t just take it from us, check out these reviews from some of our happy customers! “I trust Johnny’s Auto Service 100% and wouldn’t go anywhere else. I have been taking my car here for 7 years for all of my maintenance and they have done an excellent job every time. Clean, on time and good communication with their customers”. “Take your vehicle to no other mechanic! Johnny’s Auto’s crew and owners Byron and Tami are honest and honorable people, doing the work needed, doing it well, and NOT trying to charge up unneeded repairs”. We are a full-service local auto repair shop in West Covina. Part of what makes us the best auto repair shop in West Covina is that we do it all. Some of the services we offer are: oil change, smog test & repair station, engine rebuild and replace, transmission rebuild and replace, electrical diagnostics, tire mounting and balancing, and computerized wheel alignments. All of our services are backed by our 2-year/24,000-mile warranty. Which means if the same problem occurs again within this warranty, we will repair it again, free to you! Another reason we are the best auto repair shop is that we have ASE-Certified technicians with many years of professional, hands-on training. 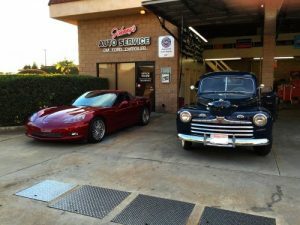 Our local auto repair shop in West Covina has been servicing customers for over 35 years, with a superior AAA rating. Did you know that only 5% of shops in Southern California are AAA approved? We have achieved 100% satisfaction from AAA surveys for three years in a row. To contact Johnny’s Auto Service, you’re welcome to give us a call or request an appointment through our “request appointment” portal online. We look forward to servicing you!